It was a close call. Other suggestions included Dr. Feelgood, Dr. Gnostic, Contrarian the Barbarian and Dr. Armageddon. This guy is a simple "talking head" from the US government. He as NO credibility at all to say ANYTHING about this crises, since he was at least, 53rd economist who "started to talk" about it. Of course - 5-10 YEARS AFTER other MUCH MORE clever economists SCREAMED about coming "greatest depression". This "expert" (Roubini) - needed ONLY to switch on Internet and find about it. So it is really ridicules that this US government puppet - getting so much place now in the media, but understandable since 90% of it is under US. Roubini : How far will Trump go to keep his core supporters on his side? Nouriel Roubini, (born March 29, 1958, Istanbul, Turkey), Turkish-born American economist and educator who was best known for predicting the 2007–08 subprime mortgage crisis in the United States and the subsequent global financial crisis. Roubini Quote : "The Treasury plan is a disgrace: a bailout of reckless bankers, lenders and investors that provides little direct debt relief to borrowers and financially stressed households and that will come at a very high cost to the US taxpayer. And the plan does nothing to resolve the severe stress in money markets and interbank markets that are now close to a systemic meltdown. " 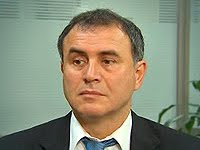 Nouriel Roubini is the Chairman and CEO of Roubini Macro Associates, LLC, his own global macroeconomic consultancy firm. He is also a professor of economics at New York University’s Stern School of Business. Dr. Roubini has extensive policy experience as well as broad academic credentials. From 1998 to 2000, he served as the senior economist for international affairs on the White House Council of Economic Advisors and then the senior advisor to the undersecretary for international affairs at the U.S. Treasury Department, helping to resolve the Asian and global financial crises, among other issues. The International Monetary Fund, the World Bank and numerous other prominent public and private institutions have drawn upon his consulting expertise. This is a Fan Based Blog ,we are not authorized , endorsed, licensed, approved, recommended, published, maintained, edited or managed by Nouriel Roubini ‏, or any of his affiliates, agents or representatives (all such persons are referred to asNouriel Roubini ‏ in this disclaimer). Nouriel Roubini ‏ accepts no responsibility or liability whatsoever for this blog or its content, including its advertising and links to other websites. No endorsement or approval by Nouriel Roubini ‏ of any individuals , goods or services is implied . Text Video and other content available on or via this blog might misquote mischaracterize , use out of context , edit or otherwise misrepresent Nouriel Roubini ‏ statements and views . Use at your own risk.